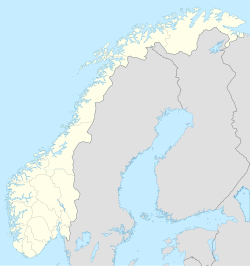 Gibostad is a village on the large island of Senja in Lenvik Municipality in Troms county, Norway. Gibostad is a former trading centre, located about 20 km (12 mi) north of the Gisund Bridge. Many of the buildings in the harbour area are about 200 years old. The soil is very fertile and perfect for farming; that is why it is also the home of an agricultural school at Senja High School. The lake Lysvatnet is located just west of the village. The 0.4-square-kilometre (99-acre) village has a population (2017) of 326 which gives the village a population density of 815 inhabitants per square kilometre (2,110/sq mi). For a long time, Gibostad was the administrative centre of Lenvik, but the administration was moved to Finnsnes during the 1960s, following the growth of that city. Gibostad is the largest village on northern Senja, located about midway between Botnhamn and Finnsnes, where the strait of Gisundet is narrowest. The village of Bjorelvnes and Lenvik Church lie directly across the strait from Gibostad. ^ a b c Statistisk sentralbyrå (1 January 2017). "Urban settlements. Population and area, by municipality". ^ "Gibostad" (in Norwegian). yr.no. Retrieved 2012-12-06. This page was last edited on 26 August 2018, at 03:14 (UTC).